With a prominent facial structure, it is easy to see the ruggedness this man conveys. 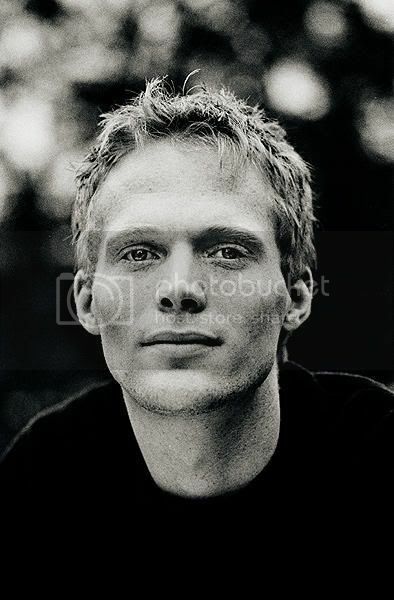 For instance his cheek bones are strongly defined to the extent that his jawls seem to sink in. As well, his brow ridge is quite bold, extending far enough that it leaves his eyelids nearly hidden and causing his eyes to become sleek in his overall look. Of his eyes they are coloured a light blue with a ring of navy on the outter edges of the iris. They are also boardered by fairly thick lashes and rusty bushy brows. Eyes sit center with his wide nose and its straight bridge. A thinly stretched mouth of shallow pink has the tendancy to set in a sneer, whether by nature or of subconscious design. A square chin usually has scruffy copper whiskers covering it and the jaw line - from ear tip to ear tip. To top it off, the man usually keeps his straight reddish brown hair short and rarely well kept. In fact, more often than not, his hair goes in every direction upon growing to a long length. Here's a lad born to a woman who really didn't care for the offspring she bore - as happenstance and previous encounters had rote. Yet, here was a woman who fell desperately in love with a man and made him happy by bearing two sons for him. Typically, when she was finished with the man - a soap opera all in itself - she was finished with the boys as well. She had no maternal instinct what so ever nor did she have the time. Their father on the other hand, tried his earnest to make up for what they lacked in a mother. J'rdon was raised in a large close knit family before he had come to the Weyr and impressed his bronze Kujath. Therefore, he only felt it right to try and spend as much time with his son's as possible. Unfortunately as it was, the man himself had very little time in between dragon care and his duties - but he tried at the very least. Weyrbratting for most of his young Turns, Nalkor turned out to be a character that neither begged for attention nor really wanted it, allowing him a chance to disappear when he could. Only Nalkor knows what he was up to during those escapades where he vanished, though some say he got into the wine - more of a retrospect deduction though. When he became of age, he didn't have interest in Weyr duties and never once mentioned standing. He only stood twice for the sake of his father, wanting to improve the man's mood - which over the Turns had gotten bitter and scornful. His mother would only come around to see him stand and then immediately leave after he was left on the sands twice. Another failure - she would later say. It was evident then to Nal that he couldn't stay. Thus, Nalkor strayed away from the footing of his parents, opting to wander away from the Weyr when a Vintner lured him to the Craft. After all, he was born to Benden and had been sipping the wines ever since he was old enough not to drop a wine goblet - so why not study its making? One word would be able to describe the Turns spent under a guiding Vintner thumb since he left Benden - adrenalizing. The rugged free form life style suited the youngster, stimulating the dormant mind of a weyrbrat into one of a creative businessman. Although he was never established as a brewer, as one might assume every Vintner must master, he found his growth strong in public relations. This soon developed; having earned some life experiences that lead him toward other ventures of his craft. With promotion, he became rigorously involved with distributing Vintner products, also becoming actively interested in the increase of his own profits by offering to work out financial deals with buyers. On the off chance they didn't know what to do with the product, he also offered lessons on how to store the products correctly - for a price. Before long, he was known as a distributor. A man who would bring you what you needed before you knew what you wanted. His journeying has taken him across the vast Northern landscape, where he’s gained much of his current experience with life in general. He’s craftier than most would expect a Vintner to be. A man can pick up quite the book of knowledge when spending Turns on the road. It was one such day on the road, scouting a route through the High Reachian passes that his journeying was interrupted. Unknown what was actually the reason for their appearance, two Xanadu riders, long from their home, dropped down on that mountain pass. Along with Keziah, a local beast apprentice, Nalkor found his life’s journey at a cross road — he decided to give Weyr life another shot, following a quite beautiful rider into the Southern lands of Pern. 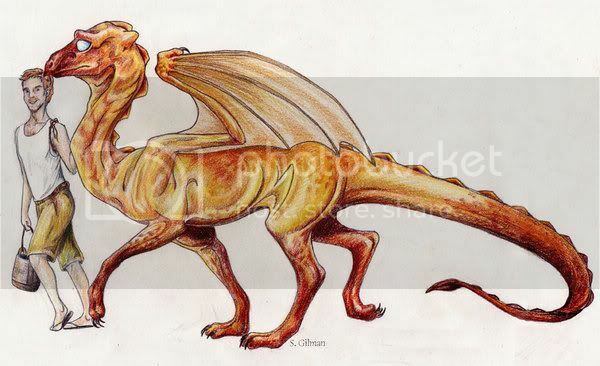 Smooth, glimmering russet caresses over muzzle, lightening into a light copper as it flows across this dragon's triangular head and head knobs. Short and straight head knobs bubble into gold as copper flows, spilling about the edges in chaos before descending down a sinuous neck. Each russet ridge foams gold around its base, little hiccups of rocky color in a copper waterfall, which ends in a clash of gilded bronze and russet against gold shoulders. That same bronze color solidifies over his ridges and wing spars as it reaches up from shoulder blades, curling into paler colors over translucent membranes in the formations of clouds. Where membrane meets spine, condensed bronze seeps to antique, raining down on golden hips and coppery ridges in splattering droplets that seep into the surrounding color. As the blending of antique bronze with copper and gold descends down his muscular legs, muddy banks of burgundy form, thickening on his feet in stark contrast to his lighter belly. A willowy tail follows similar suit, burgundy raindrops engulfing lighter streams of gold and muddying half way down, leaving his spade a dark ruddy brown. Much like a dolphins face, there seems to be a permanent smile attached to this rather chubby looking blue-gray firelizard. His wings seem extensions of his plump juiciness, rather than seeming like thin wafers, it's almost more like pita bread for the wings a much darker blue. Thin bands of midnight blue swirl around him increasing in size as they meet along his belly and twist around his stubby and quite plump tail. There is something monotonous about this little firelizard, his hide an unending wash of sandy brown. Deeper examination will reveal that his coloration is made up of a multitude of shades, khaki and ecru, w heat and tan, each represented as a tiny dot jammed together so tightly that from afar, he appears as a single shade. His body is built for speed with slim lines and whippy muscles. His wings are perhaps overlarge, overwhelming his body in a gawky way. His muzzle is slender and delicate, his eyes huge in his wedge-shaped head. His paws are small and curled, his whole body beautifully boned. It seems that his coloration only serves to enhance his fine lines, rather than dstract the viewer. A dainty head swivels at the slender end of her arching serpentine neck. Opposite chest heaves in a gusty sigh. The kind of sigh as one tends to do when your message /finally/ filters through to your chosen speaker. Patience perhaps not her strongest suit as softly muscled arms tense, steely talons slicing into her perch. Haunches are more substantial followed by a rather slender whip-length of tail. Wings seem a bit over large for her body, strong of shoulder and deep of sail. It cuts into the extremes of agility that her kind can display but in turn allows her a greater endurance as she soars on the invisible currents of air. Of hue her body is a blended mix of greens that seems to have a majority of darker ragged edged bitter salad greens.